The Liberty Bell replica once mounted above the 700 Level at Veterans Stadium has been installed outside of Citizens Bank Park, near where the Pass and Stow beer garden will be. Exactly 15 years after Veterans Stadium was demolished to make way for Citizens Bank Park, the Liberty Bell that once hung above its seats in the 700 Level has returned to the realm of Philadelphia baseball. The Phillies tweeted Thursday that, in conjunction with the anniversary, the bell was installed outside Citizens Bank Park in an homage to the past. At 19 feet tall, the bell weighs more than 5,000 pounds and uses more than 300 light bulbs. The bell's installation is in conjunction with the new beer garden opening soon at the ballpark, replacing the since-departed McFadden's near Third Base Plaza. 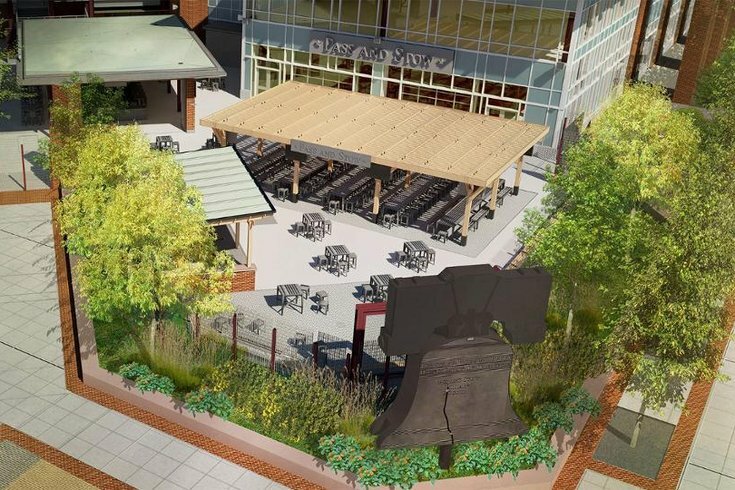 The new beer garden, Pass and Stow, is itself an homage to the Liberty Bell – the original one in Independence Mall was recast by John Pass and John Stow in 1753. Renderings of the new beer garden show the bell on display. The beer garden and the bell's return to South Philly will be in full view next week when the Phillies take on the Atlanta Braves for the home opener on March 28. The re-emergence of the Vet's Liberty Bell is second dose of nostalgia for the Phillies (and Eagles) former stadium. On Thursday, to mark the anniversary of the implosion of Vet, Twitter users posted videos and photos of the stadium.